It descends with a challenge upon the censors, and yet this powerful story had to be told, for it is so much a part of a struggling, impetuous generation of youth in Canada. It is sometimes brazen, sometimes explosive, always face to face with gripping reality, shocking as that may be to those who shy away from life’s more lurid facets. 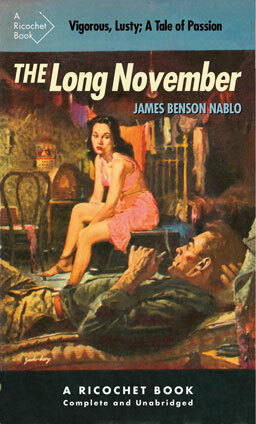 First published in 1946, The Long November enjoyed six different editions in nine years, making it one of the best selling Canadian novels of the post-war period. Its last appearance, as a pirated paperback, speaks to its reputation as a gritty, raw and ribald story that few publishers dared touch. This new edition is the first in sixty-seven years. The Long November is the story Joe Mack, son of the grittier side of Cataract City – Niagara Falls – and his struggles to make something of himself; all for the love of well-to-do blonde beauty Steffie Gibson. It’s about rum running booze, Chicago beer trucks, Bay Street sharpshooters, the mines of Northern Ontario and fighting the Nazis in Italy. It’s also about the women, the many women - married, unmarried and widowed – who shares Joe’s bed. But they mean nothing – it’s Steffie he wants. James Benson Nablo(1910-1955) was born and raised in Niagara Falls, Ontario. A veteran of the RCAF, he worked briefly for publishers in Toronto and New York. After the publication of The Long November, Nablo made his way to Hollywood where he wrote for the studios. A Bullet for Joey (1955), starring Edward G, Robinson and George Raft, was one of four feature films adapted from his stories. Brian Busby is Ricochet Books’ series editor. He is the author of A Gentleman of Pleasure: One Life of John Glassco, Poet, Translator, Memoirist and Pornographer (McGill-Queens, 2011) and editor of The Heart Accepts It All: Selected Letters of John Glassco (Véhicule Press, 2013). 160 pp 7" x 4.5"